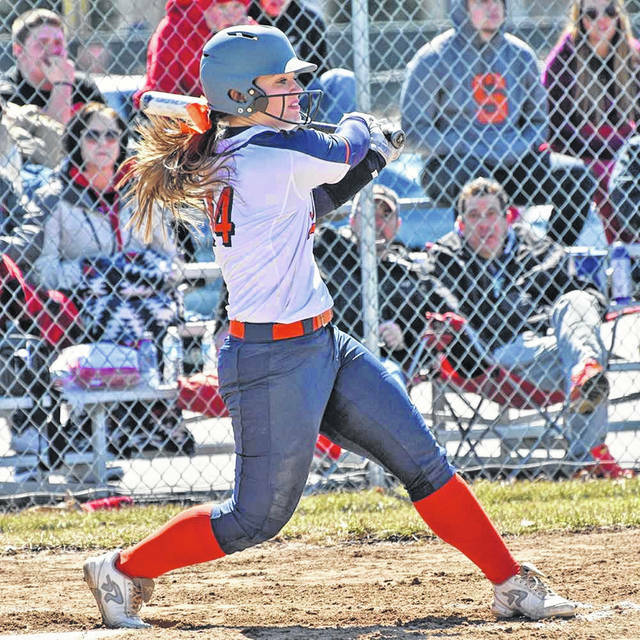 BUCYRUS — As to be expected, the weather played a big factor in Saturday’s softball season opener between the Galion Lady Tigers and the Bucyrus Lady Redmen. In a doubleheader originally scheduled to be played on Galion’s home turf, the action was not only moved to Bucyrus but saw game time pushed back a few hours. It would not slow down the Lady Tigers however as they defeated the Lady Redmen in both games on the day to begin their 2019 run at 2-0. Game one would see Galion emerge victorious by a final tally of 4-1. Bucyrus would strike first thanks to a first inning sequence of a walk, stolen base and a single but it would prove to be the only run for the Lady Redmen. Galion put the game away for good with two runs in the fourth inning thanks to singles from Kate Schieber and Teanna Greter. 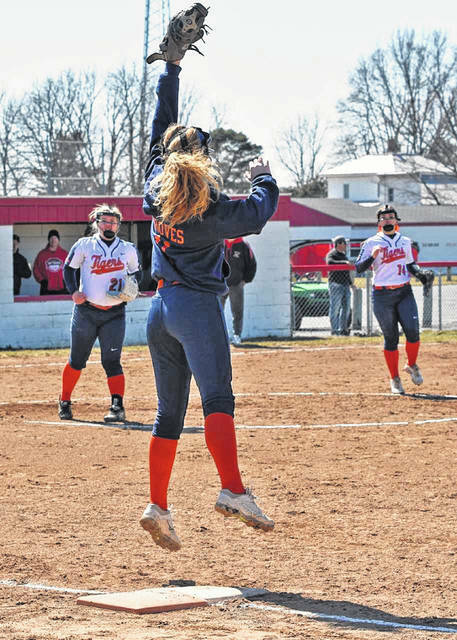 Madelyn Thomas dominated in the pitcher’s circle for Galion, going the distance and while allowing just one hit and one run while striking out a career high 16 batters. The Lady Tigers finished with 10 hits in the game, led by Schieber going 3/3 at the dish while Greter and Gabby Kaple batted at a 2/3 clip. Emily Sedmak, Nevaeh Clark and Emily McDonald finished with a hit at the plate to round out the Galion offense. Galion finished with zero errors in the field en route to the one-hitter from Thomas. Caleigh Rister pitched for Bucyrus, giving up four runs on ten hits over six innings of work while striking out 11 and giving up no walks. BUCYRUS — In the first inning, Galion got their offense started when Kaple and Greter found their way on base with singles. Shortly after, Clark drove them both home with a double to right-center field. However, Clark was tagged out trying to stretch her double into a triple at third base. Clark would get her revenge in the third as she hit another shot to right-center, this time making it safely to third with a stand-up triple. She scored the only run in the third off on Schieber’s RBI single. In the fourth inning, Galion tacked on an additional six runs starting with Kaple and Clark, who singled, then a groundout by Kayden Caudill, and a double by Greter. 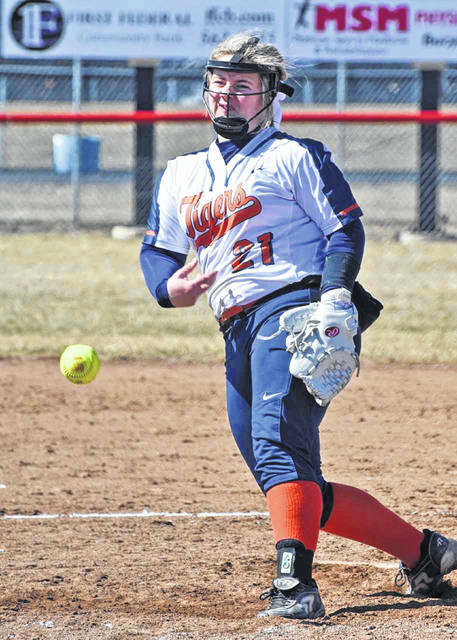 Thomas was in the circle again for Galion, picking up her second win. Thomas didn’t allow a run as Galion defeated Bucyrus by a final score of 10-0 in a shortened, five inning contest. Thomas allowed just four hits while striking out seven ending the day with 23 total strikeouts in the two games. Galion finished with 17 hits in the game led by Kaple, Emily Sedmak, Clark, Thomas, Schieber, and Greter each collecting multiple hits for the Lady Tigers. Galion was spotless again in the field in the second game of the afternoon. The Lady Tigers contest with the Elgin Lady Comets, scheduled for Monday, March 25 was cancelled but Galion will return then home to play host to Mid-Ohio Athletic Conference rivals, the Pleasant Lady Spartans on Tuesday at 5:15 p.m. On Wednesday evening, those same two squads will meet again on Pleasant’s home field.